Jill Spratt is a Lecturer in Advertising, Design & Branding and Course Director of the BDes Hons Graphic Design and Illustration course at Ulster University. She has worked for over a decade in Ireland and internationally for agencies such as AV Browne, Rehab Studio and Gamut, her own consultancy. 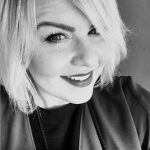 Her work has focused on brand and strategy, graphic and digital design for clients such as Bild, Vodafone Germany, BBC, Capita, HP, Belfast City Council, The MAC, Hastings Hotel Group, Invest NI and Tourism Northern Ireland. Jill’s research interests relate to branding, brand strategy, typographic design, cross-disciplinary design processes and design perception. She is a member of the International Society of Typographic Designers and serves on the ISTD Education Team.